Skeletons in old Fort McKavett. When an archaeologist found the skeleton buried beneath what once was the floor of Officers Quarters Number 4 at old Fort McKavett near Menard, he dug up a mystery. Much is known of the history of Texas, but there are plenty of questions historians and archaeologists may never be able to answer. Like the mini-mystery of the bones under Officers Quarters Number 4. The bones under the L-shaped stone building belonged to a domestic cat. When miscellaneous cat bones were dug up, the initial thought was that sometime in the past, a cat had died under the floor of the government building. Nothing unusual there. But then those probing the past of the old fort--established in 1853 and abandoned in 1883--found a complete cat skeleton. Nearby were the partial skeletal remains of a mouse. Back in the lab, it was noted that the mouse bones did not show any sign of "gastric acid etching." In other words, the mouse had probably not been in the cat's stomach when the feline was buried. That got them wondering if the cat remains were there by accident or intent. The find is discussed in an archaeological report prepared for the Texas Parks and Wildlife Department by an archaeological consulting firm in 1996. 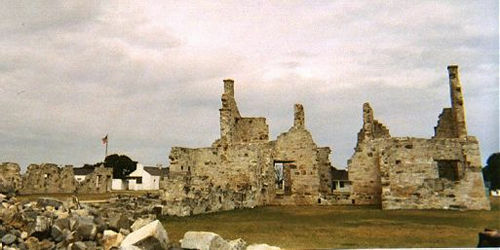 The 202-page report is based on 12 years of investigation at the ruins of the old fort, which is now a state historic site overseen by the Texas Historical Commission. Beginning in the 13th century and continuing into the early 20th century, walling cats into buildings was a common practice in England and certain other areas of Europe. Sometimes deceased cats went between brick walls, sometimes they were bricked in under a floor or put in the roof. The superstitious notion behind this was that a buried cat would continue to scare off plague-bearing rodents. Assuming a recent European �migr� had a hand in the construction of the officer's quarters, the Fort McKavett cat could have been placed there as a scarecrow. Well, a scaremouse. Of course, most people understood that a live feline made a better mouser than a dead one. And cats, according to a recent article in the Wild West History Association Journal by San Angelo writer Preston Lewis, were much more common along the frontier than most people would have thought. Cats generally were not brought West as pets, though some certainly were. Most felines participated in the American westward movement because they helped control rodents. Little known is that cats even became livestock, with entrepreneurial types transporting them westward with the intent of selling them at a considerable profit. Whether hoax or real, some have even claimed that there were a few cat ranches where felines were raised specifically to be sold as mousers. Felines did what their instincts compelled them to do, and people appreciated that, but cats will be cats. Screeching tomcats dodged many a bootjack flung from a hotel window when their late night serenades disturbed some slumbering Westerner. As Lewis wrote: "Their praises unsung by anyone but themselves, cats have roamed unseen in the dark corners of American frontiers past. Texas, for example, may have been heaven on men and dogs and hell on women and horses, but at least canines and equines earned some visibility and credibility for their frontier roles in the Lone Star State and elsewhere. Felines, however, still hide in the shadows of the nation's western heritage. As long as they do, the hiss-story of the Old West will stand incomplete." No real mystery, but another interesting curiosity lies buried in the 10-volume Papers of the Texas Revolution. The 1973 collection of all known documents associated with Texas' struggle for independence from Mexico shows that the early government of Texas wanted an accounting of every penny of public money spent by government employees. The young republic's military, for instance, had to account for every measure of powder expended. In one such report, someone in charge noted that 189 measures had been expended (as in fired) in connection with a group of soldiers having misidentified another group as hostile. If one measure equals one shot fired, that must have been a pretty noisy, smoky encounter. No explanation of the incident is offered in the report and no mention made of whether anyone was hurt in the flurry of accidental gunfire. Unless the story made the newspapers, probably no one will ever know why a group of soldiers from an army so recently victorious at San Jacinto could mistakenly fire 189 shots before figuring out the other individuals weren't bad guys.